Today, the Bureau of the Public Debt announced the interest rates for Series I-bond issued between November 2008 and April 2009. The total rate is set at 5.64%, including a fixed rate of 0.70% and an annualized rate of 4.92% adjusted based on the Consumer Price Index for all Urban Consumers (CPI-U). The total rate of 5.64% may look impressive, but that’s not what you are going to earn through out the period, up to 30 years, when you hold the bond. Of the two components that determine the I-Bond earning rate, only the fixed rate, 0.70%, is what you are guaranteed to earn if you purchase I-Bonds from now till April 2009. The adjustable part, 4.92%, only lasts for 6 months and is subject to change when the Treasury releases the new rate next May. So if you buy I-Bonds now, the 5.64% rate is going to last till May 2009. Since the I-Bond rates are tied to inflation, you will need to consider the overall inflation picture when making your purchase decision. 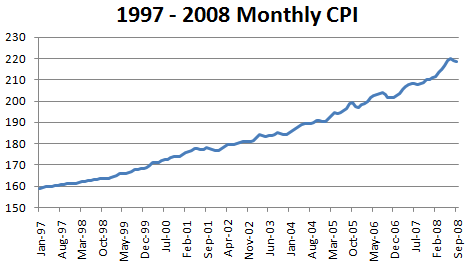 The following is a plot of monthly CPI from 1997 to September 2008, based on data from Inflationdata.com. As you can see, the CPI peaked in July when the price of crude oil approached $140 a barrel. Since then, the inflation has eased a little bit as oil price plunged more than 50% (the price of one gallon of regular gas in my area was $3.49 when I left for vacation and it’s $2.39 now). If the current economic slowdown continues, don’t expect a higher inflation based rate next May. How the fixed rate is determined? Nobody really knows because that the secrete of the Treasury. When they adjusted the I-Bond rate in May, the fixed rate went all the way down to 0.0% The 0.7% increase is nice, but nothing to get excited about. Currently, I am still making monthly purchase of $100 of I-Bond. To me, that amount is enough, because I am not really looking at I-Bonds to protect against inflation. Yeah I was hoping for a little better than 0.7%, but it sure beats zero! I have very few I bonds, I bought them back in 2002 when the fixed rate was 2% and have wished ever since that I bought more. Did you see the current rate on bonds bought back in 2000, it’s over 8%! I’ll probably buy more simply cause of the pain in my portfolio, I now realize I don’t have enough in bonds. Yes, when you have 2% fixed rate, it’s nice to own I-bonds. But at the current rate, it’s hardly appealing, especially when you can only buy $5,000. A better choice could be TIPS.